What does betterment mean to you? I know when I started my road to better health, I wanted to lose weight. I was surprised that I gain so much weight that I wasfed up with how I looked. I was committed to lose weight and I did. Little did I know that I would actually improve more than my health. I began a journey down a new lifestyle running for the first time in my life and became a Half Marathon Runner. All this would not be possible if I was first committed and determined to lose weight. I went ahead and tried nutritional supplements from Youngevity and lost more weight. I noticed that my bone and joint issues eased and started to run on a treadmill. 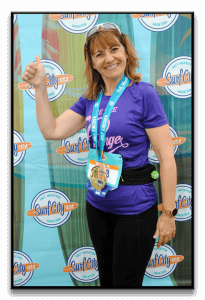 And after encouragement from my friends I started to run outside and did my first 10 K in September 2015 and my first Surf City Half Marathon at the age of 51. 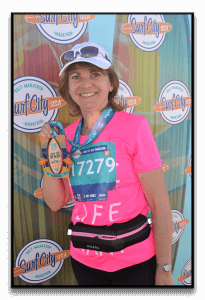 This year I shaved off 25 minutes off my 2016 Half Marathon at the Surf City Half Marathon finishing at 2:19:15. I have proved that I bettered myself. Not only in losing weight but also gained a healthy sport of running. What does betterment mean to you? Everyone has something going on. So what is not perfect in your health currently? I know I accepted what medical doctors said about my health until I started down my road of health. Is there something you want to improve? I am here to mentor you through the road of nutritional supplements, a world that has been so foreign to me until I had my health break through. I am not a medical professional at all. I am a person who has found success, and I want to share it with you. I can put you in contact with two Naturopathic Doctors if you have any more questions. Start on your road of health. Open your minds to something that could help you. It did for me. Let me be your tour guide.